Mitsui O.S.K. 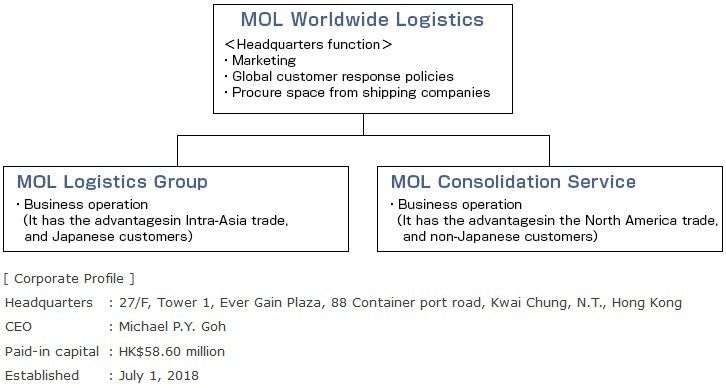 Lines, Ltd. (MOL; President & CEO: Junichiro Ikeda) today announced the establishment, effective July 1, of MOL Worldwide Logistics Ltd. (MWL), and that they will lead MOL Group non vessel operating common carrier (NVOCC) business(*1) in Hong Kong (*2). MOL Executive Officer Michael P.Y. Goh was appointed CEO of MWL. MWL has been making various preparations including permission of acquisition from relevant authorities, aiming for an October 1 launch of MWL business operations. As the MOL Group NVOCC headquarters, MWL will manage the NVOCC business of MOL Logistics (Japan) Co., Ltd. (President: Shuhei Togo; headquarters: Tokyo) and MOL Consolidation Service Ltd. (CEO: Michael P.Y. Goh; headquarters: Hong Kong), by negotiating freight rates with shipping lines by integrating the cargo volume of both companies, and handling marketing, network operation, and response to global customers. With a network of 360 offices in 61 countries, it aims to increase container cargo volume from current 350,000 TEUs to 550,000 TEUs within three years. The MOL Group continually works to enhance its NVOCC business to meet customers' diverse needs for general cargo transport with top-quality services. * 1: Non Vessel Operating Common Carrier (NVOCC) does not have own transport means (vessels), but carries cargoes between ports and to the final place of delivery by using other shipping companies. * 2: Please refer to the April 25, 2018, press release for details: MOL expands its NVOCC business with the unified brand "MOL Worldwide Logistics"